Rydale Roofing is celebrating 25 years in business by holding 25 fundraising events for good causes in 2018. The Silverdale based roofing company has forged a reputation for supporting numerous charities and good causes in its local area. Highlights of the 2018 fundraising campaign will see members of Rydale Roofing’s staff sky-diving and taking part in the Screwball Rally. Rydale Roofing was founded by Mick Mirowski in 1993 when he decided to return to the roofing trade after being made redundant when the Trentham Super Pit closed. 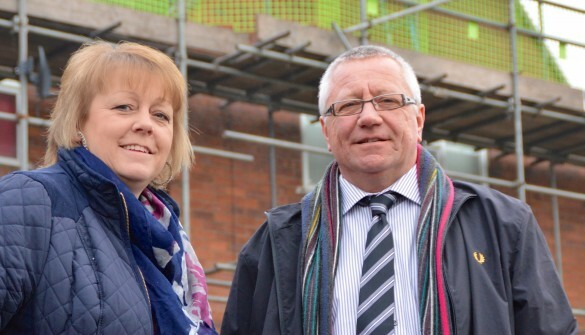 Rydale Roofing has worked extensive with Aspire Housing on home improvement programmes across the borough of Newcastle-under-Lyme, and on landmark projects such as CoRE, Longton, and the Blurton Extra Care Village. Led by husband and wife, Mick and Julie Mirowski, it is a true family business, with sons Ryan and Dale and their partners, Sam and Sammi, all involved. “We named the business Rydale after Ryan and Dale and we are proud to have created a true family business,” said Julie. “This extends to our employees who feel like family. All live within five-miles of our Silverdale base and we have a low turnover of staff. Our longest serving employee, Tony, has been at Rydale for 18-years and many others have been with us for six years or more. “All the staff are keen supporters of our fundraising programme. Dale is taking part in the Screwball Rally, a fundraising event where teams drive on a circular route from Calais, taking in Belgium, the Netherlands, Germany, the Czech Republic and Poland, and Sammi is taking part in the sky dive. Numerous charities have benefited from Rydale Roofing’s fundraising and Julie is also a Trustee at the locally run Alice Charity. Rydale have been prominent supporters of Autism Awareness UK, Young Enterprise and the KMF Young Engineer of the Year programme. The company has supported many local children’s football teams dance troupes with kit sponsorship and sponsor Newcastle Town FC’s Academy.